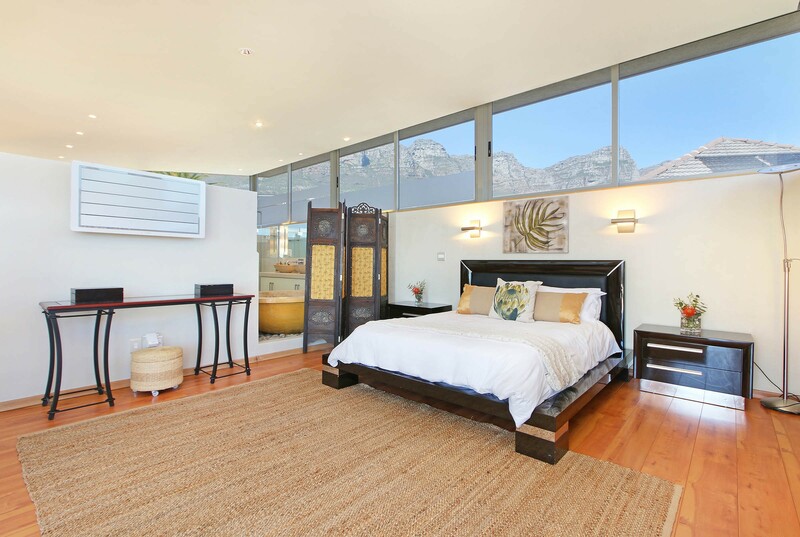 Breathtaking views of the mountains and Atlantic Ocean are the trademark of this villa in Camps Bay. A contemporary architect-designed house built on different levels to maximize the views, enjoy privacy and increase entertainment options. The lounge, featuring a fireplace and dining area with air-conditioning, opens onto a patio that overlooks Camps Bay beach and Lion’s Head. 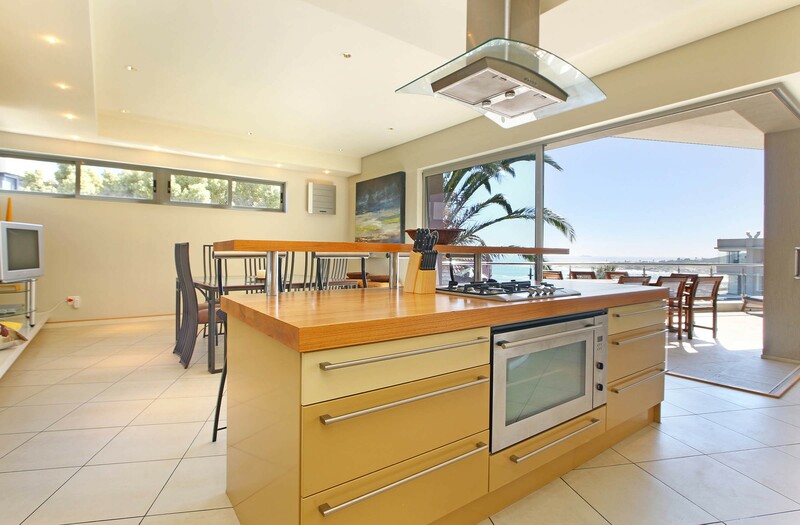 The kitchen is directly attached to the lounge with lounge seating and a further dining area for easy entertaining. 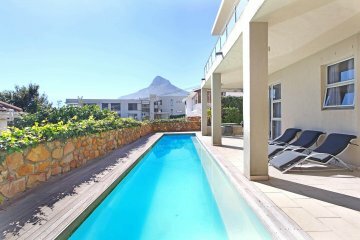 The property features a swimming pool, panoramic views, 2 terraces, air-conditioning, housekeeping, internet and a satellite TV. There is secure garage parking for two cars. The villa is serviced 6 days per week and has 24/7 management support. 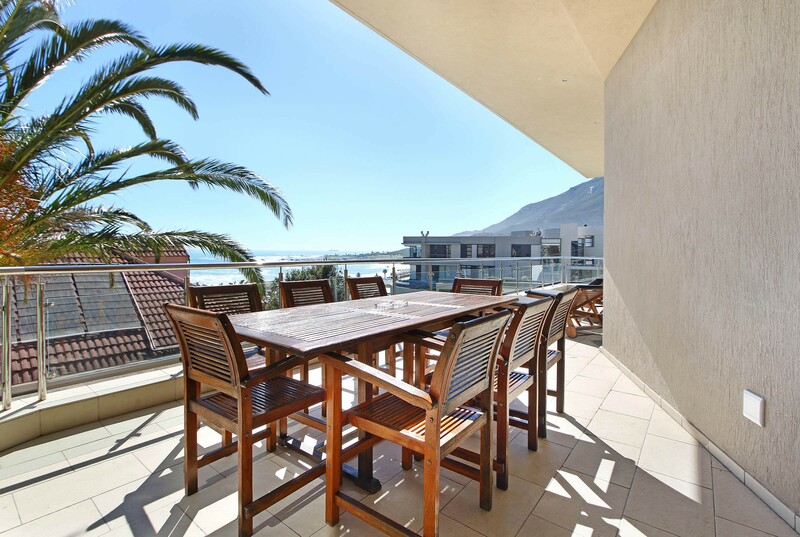 The Rocks is within close proximity to the beach and Camps Bay strip of restaurants and shops, the villa is situated in the quiet bottom end of First Crescent. 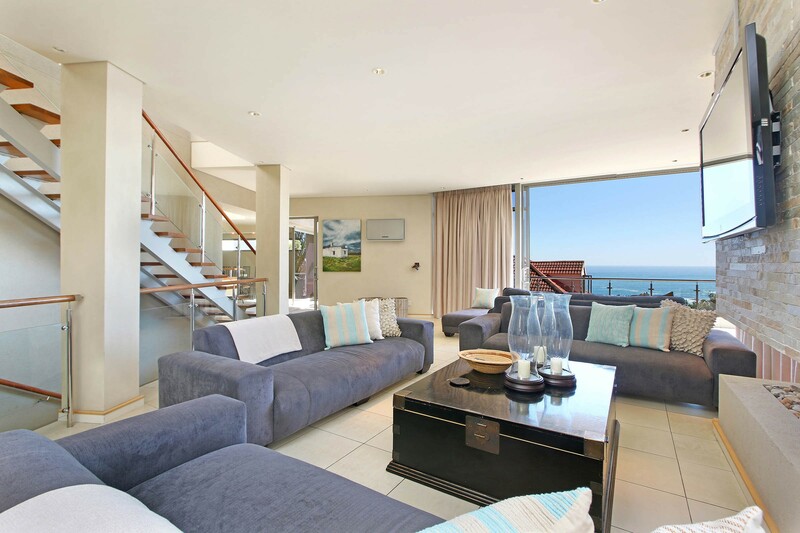 A flight of stairs in the lane next to the villa allows for easy walking access to Camps Bay Drive. VILLA GENERAL The villa has combined tile and parquet wooden flooring. Style is comfortable and contemporary. Full alarm system linked to armed response and 24-hour electric fence. All rooms with air-conditioning/heater and 3 rooms has sea and mountain views. The master and feature bedroom, which takes up the entire top story of the house, has panoramic views of the mountains, ocean and beach. 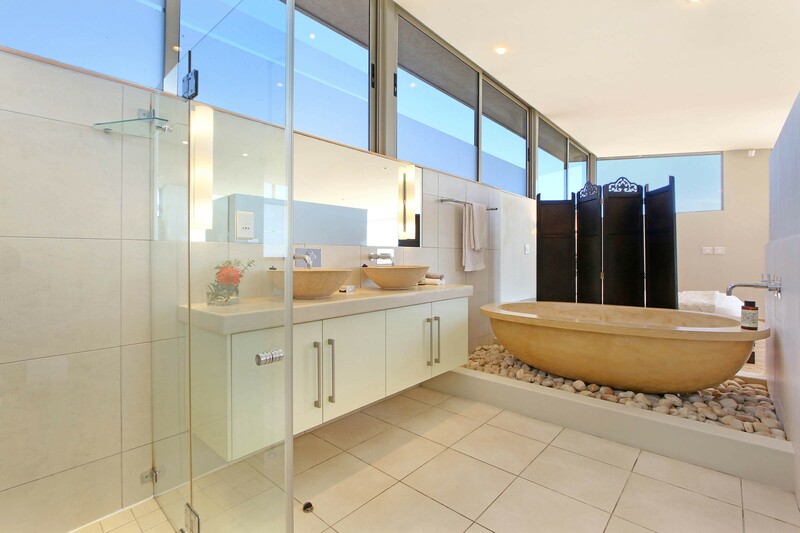 The en-suite bathroom features a bath, shower, double basins and a large his and hers dressing room. The bedroom opens onto its own patio with outside dining and deck chairs. The bottom level of the house features an expansive 15m lap pool next to a deck that flows from the second two bedrooms. 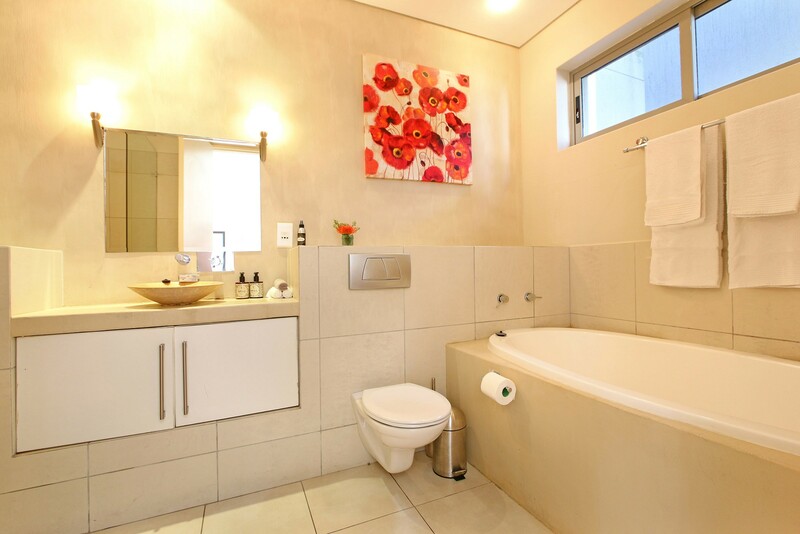 Each of these rooms has en-suite bathrooms. 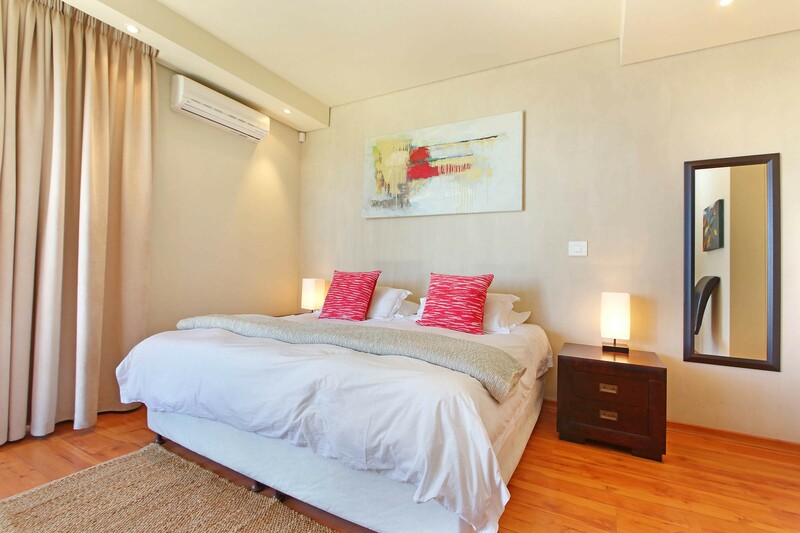 A further bedroom with 3 single beds is adjacent to these two rooms. STREET LEVEL consists of the double garage. Guest access is secure via the automated double garage entrance or the front gate and door. Double volume lounge with large sliding doors leading to patio area. Gas fireplace; sea and mountain views. Dining room with 8-seater table; lounge seating next to dining; sliding doors leading to patio with al fresco 8-seater dining table. TV area with easy lounging. Fully fitted open plan kitchen with discrete scullery and laundry room containing washing machine and dryer. Weber BBQ. 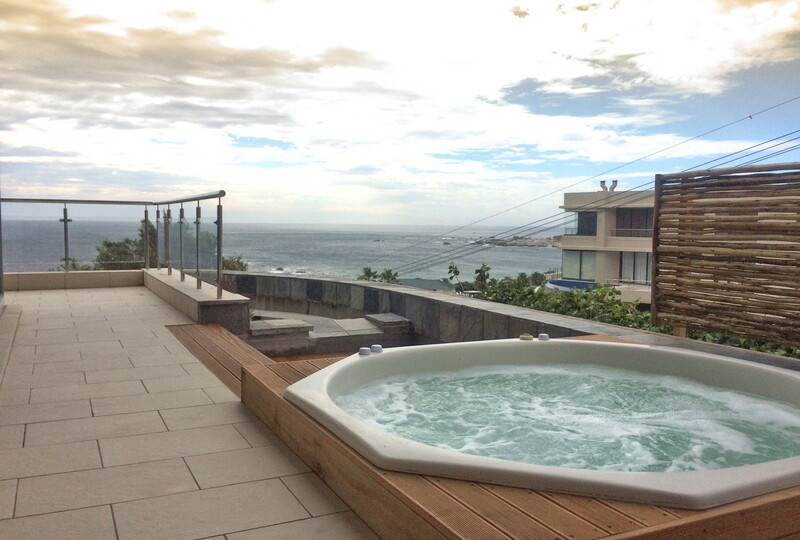 TOP LEVEL: BEDROOM 1 – Queen size bed; en-suite bathroom with double basins, bath and shower; double walk-in closet; patio fitted with al fresco 6-seater dining table and sunbeds, featuring stunning sea and mountain views. 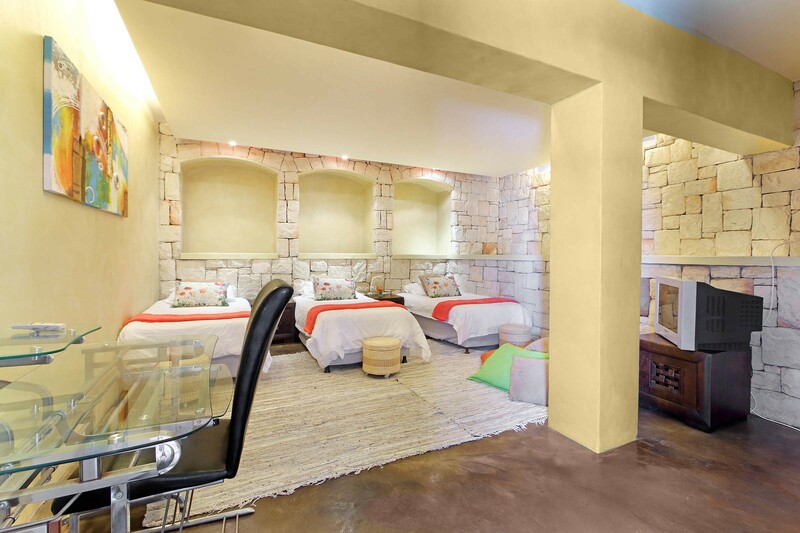 POOL LEVEL: BEDROOM 2 – King size bed; en-suite bathroom with bath and shower; large sliding doors opening to pool deck; lounge seating and TV; Aircon. 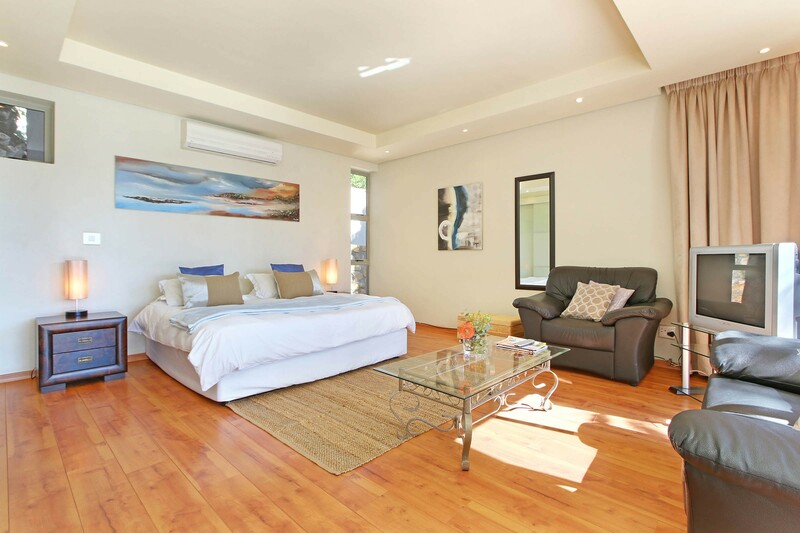 BEDROOM 3 – King size bed; en-suite bathroom with shower; large sliding doors opening to pool deck; TV; Aircon. BEDROOM 4 – 3 twin beds (can be made up as a king size); TV; Aircon. This room shares a bathroom with bed 2 or 3. Patio features a 15m Lap pool with 6 x loungers; Weber BBQ. Beautiful views of the ocean and Lion’s Head. Camps Bay beach and promenade with its well-known sidewalk strip of trendy restaurants, bars, coffee spots and retail outlets – is just down the road and perfect for enjoying sundowners or a vibey night out; whilst the Theatre on the Bay, featuring excellent local productions, is also within an easy walking distance. 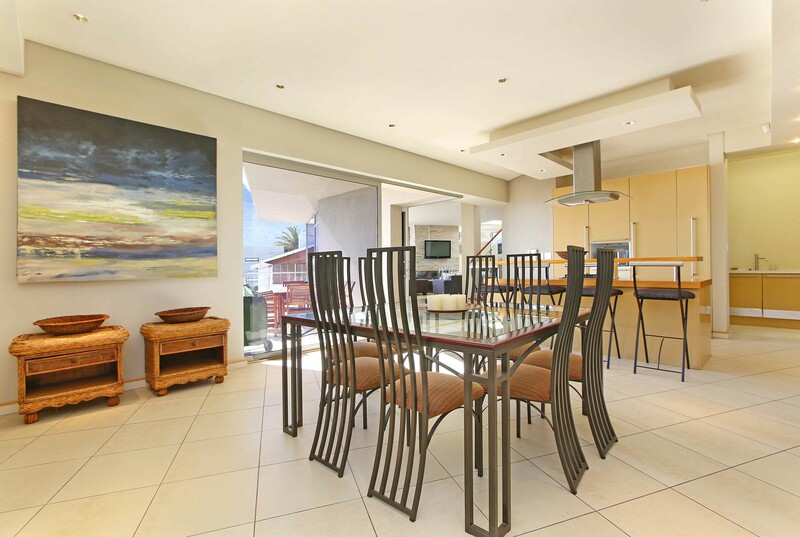 Table Mountain is a short drive up the hill and the city centre and V&A Waterfront shopping precinct 10mins away. 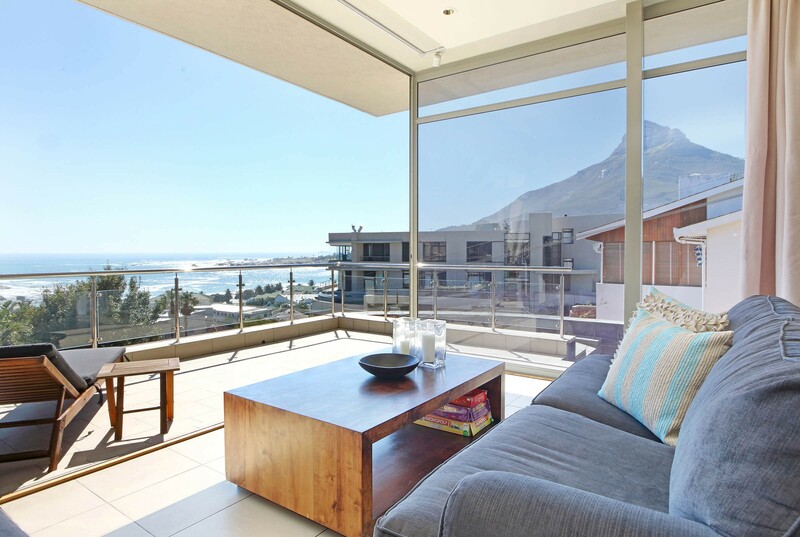 A sought-after and luxurious residential area, Camps Bay is home to Cape Town's wealthiest and most well-known. Nestled between the breath-taking mountain range and its heavenly beaches, the casual yet classy atmosphere offers the ultimate holiday experience. 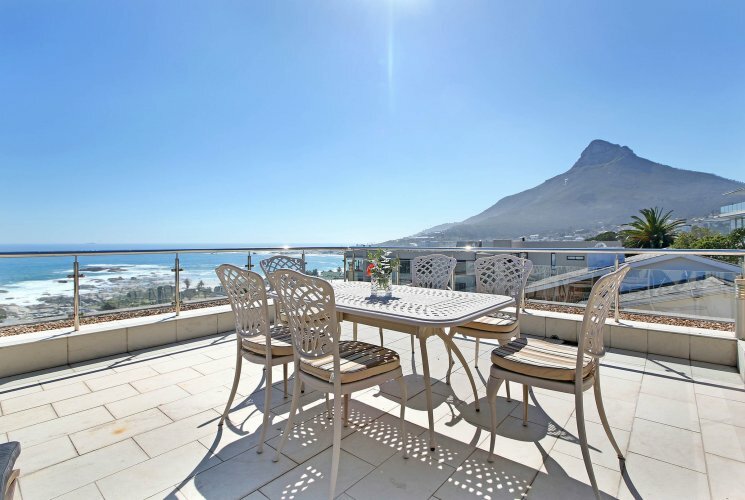 Camps Bay is one of Cape Town's most beautiful and exclusive beach areas. Being an internationally renowned travel destination, the sandy white beach and blue water stretch is idyllic, complemented by grassy areas and palm trees. Set against the backdrop of the Twelve Apostles mountain range and Lion's Head – and only 10 minutes from Cape Town's city centre, it's a favourite choice for both foreigners and locals.